When domestic firms in the United States encounter foreign competition, they sometimes seek protection or import restrictions through the US government. These trade remedy regulations include tariffs, import taxes, antidumping, countervailing duties, and safeguards. But what’s good for a relatively small number of firms isn’t necessarily good for the nation. Unfortunately, the government is limited by statute to consider only the interests of the few domestic firms seeking special protection. It is not allowed to consider “downstream” industries and users—the other American manufacturers, workers in industries along the supply chain, and consumers who rely on the goods in question. This limited approach is inherently biased in favor of special interests—specifically, a subset of organized domestic producers seeking special protection—and overlooks the rest of the country. As a result, trade remedy regulations often do more harm than good. A small change to the relevant statutes allowing the government to consider American downstream industries and users would curb the costly unintended consequences of trade remedy regulations. Trade remedy regulations provide special protection for specific groups of domestic firms. Import restrictions such as tariffs, for example, lead to higher prices on imported and domestic goods, which can provide the domestic firms with temporary “import relief” (a period of time during which they can charge higher prices as a result of import restrictions). The costs of those higher prices, however, are largely shouldered by downstream American industries and users of the protected good. Ultimately, those costs are passed on to manufacturers and consumers across the economy, who pay more for the everyday products they rely upon. The US International Trade Commission (“Commission”) shall identify the downstream industries and users. The Commission shall determine whether there is a reasonable indication that the downstream industries and users would be materially injured from a duty on the imported merchandise. The Commission shall determine whether there is a reasonable indication that the benefits to the subject industry from the duty would be at least as great as the cost to the downstream industries and users. These provisions would remove the inherent bias in favor of special interests and ensure downstream users are considered. The provisions would also prevent the US government from responding to behaviors by foreign firms and governments in a way that imposes net costs on Americans. In turn, US trade remedy laws would be fairer, more transparent, more efficient, and more aligned with the national economic interest. This section describes generally the trade remedy laws, namely antidumping, countervailing duties, and safeguards under Section 201. We also describe the Section 232 process, which investigates the national security effect of imports. The US government can initiate an antidumping and countervailing duty investigation when petitioned by domestic industry, or it can self-initiate an investigation whenever the Secretary of Commerce determines that a formal investigation is warranted. Most investigations are initiated in response to petitions filed by domestic industry. When an American firm accuses a foreign firm of dumping in the US market, the first step is for the firm to file a petition with the US Department of Commerce. The second step is for the Commerce Department to determine whether dumping is occurring. That determination is made by assessing whether and to what extent the subject imports are being sold at less than fair value (“dumped”) in the US market, receiving unfair foreign subsidies, or both. If the Commerce Department decides that there is merit to the claim, the next step is for the Commission to determine whether there is a reasonable indication that an industry is materially injured or threatened with material injury, or whether the establishment of an industry is materially retarded because of the imports. If the Commission concludes that the dumping does inflict injury on the industry asking for protection, then duties are imposed. Under current statute, the Commission can consider only the industry asking for protection. Downstream industries and users have no legal standing in trade remedy investigations, and the Commission is not allowed to consider downstream industries and users in its determinations. As of April 2018, there were over 400 antidumping and countervailing duty orders in place, according to the Commission. Over 60 percent of these orders have been in place for over five years (and some have been in place since the 1970s and 1980s). Over half of these duties are on imports of iron and steel products. These products include, for instance, intermediate inputs such as “certain cold-drawn mechanical tubing of carbon and alloy steel” that are typically used in industrial construction with structural columns, beams, and heavy equipment frames, and with machine parts; these imports face import taxes between 8 and 42 percent. An example of a consumer product is “tool chests and cabinets” imports, which face an import tax of up to 95 percent. Section 201 safeguard investigations are similar to antidumping and countervailing duty investigations in that the Commission must find material injury (or threat of material injury), but it is up to the president to make the final determination to impose an import tax or other restriction. The statute requires that any action taken must facilitate a positive adjustment to import competition and provide greater economic and social benefits than costs. The White House is not required to make public its method for calculating economic and social costs and benefits. For example, a recent Section 201 safeguard case resulted in a 30 percent tax on American importers of “solar panels as well as cells, the piece of equipment that converts sunlight into electricity.” The 30 percent rate will decline after the first year and be 15 percent in the fourth year. Another recent Section 201 safeguard case resulted in a 50 percent tax on American importers of large washing machines. Section 232 of the Trade Expansion Act of 1962 (as amended) gives the executive branch the ability to conduct investigations to determine the national security effects of imports. Section 232 is not under the umbrella of trade remedy regulations for the purpose of this brief, but it is worth mentioning given its recent prominence. Under current practice, the Commerce Department issues a report to the president with its findings, including whether certain imports threaten to impair America’s national security. We would recommend that the national economic interest, which includes the economic effects on downstream industries and users, be considered explicitly by the appropriate agency (e.g., the Commerce Department or the Commission). This would allow the president to consider the national economic interest in the national security interest decision-making process. In the most recent case, the Commerce Department delivered the Section 232 reports on steel and aluminum to the president in January of 2018, and the president had 90 days to determine whether he concurred with the findings and would use his statutory authority to restrict trade. There have been 16 cases since 1981. The current Section 232 investigations on steel and aluminum are the first such cases since 2001. The US economy is one of the most competitive in the world and consistently scores in the top three on the Global Competitiveness Index. Competitiveness and prosperity go hand in hand. Competition fosters innovation, productivity, and growth, all of which improve living standards, foster well-being, create wealth, and reduce poverty. Businesses want competition to be fair and on a “level playing field.” In reality, American companies often have to compete against foreign firms that are highly subsidized by their domestic governments. There is no level playing field when one firm competes with another firm that has so much government backing it can sell at a fraction of the “true” cost of production. As the argument goes, the US government uses trade remedies such as antidumping, countervailing duties, and safeguards to respond to dumping and perceived unfair competition. An import tax can appear as the appropriate remedy for an unfair trade practice. When the price of imported goods is too low, less than fair value, then a duty will bring the price up to something that is fair. At face value, this may seem reasonable. In reality, it is not. First, the higher import price may provide import relief to the few domestic firms seeking protection, but everyone else who needs those imports for production now faces higher prices. Second, there is no economically sound definition of “less than fair value,” and the current application does not even align with the US Federal Trade Commission’s view (see box 1). The foundation of the statute is inconsistent with domestic antitrust laws. Third, the Commerce Department’s dumping determination process is plagued with methodological and calculation inconsistencies that can result in meritless dumping determinations. Legislative changes and pressures from interest groups over time have transformed these trade regulations from a tool to respond to unfair trade practices into a weapon used to stymie competition in favor of a few domestic firms at the expense of other domestic firms and American consumers and workers. Finally, while antidumping, countervailing duties, and safeguards are responses to unfair competition from abroad, they do not necessarily change the offensive behavior. In the name of addressing one industry’s injury inflicted by a foreign firm’s unfair trade behavior or selling at less than fair value, a trade remedy can end up inflicting even greater injury on Americans. This is because the Commission’s assessment of material injury as a result of imports is limited to the domestic firms seeking protection. Under current statute, the Commission is not allowed to consider the downstream industries and users of the imports, even if those firms and workers rely on the imports for their commercial viability. The limited purview in the statute is problematic because antidumping, countervailing duties, and safeguards can impose heavy costs on the implementing country. While the penalty can be beneficial to the few domestic firms requesting protection against import competition, this advantage is often short-lived and can result in lasting net negative effects for numerous downstream firms, workers, and the economy as a whole. America’s experience with the George W. Bush–era steel tariffs shows this clearly. 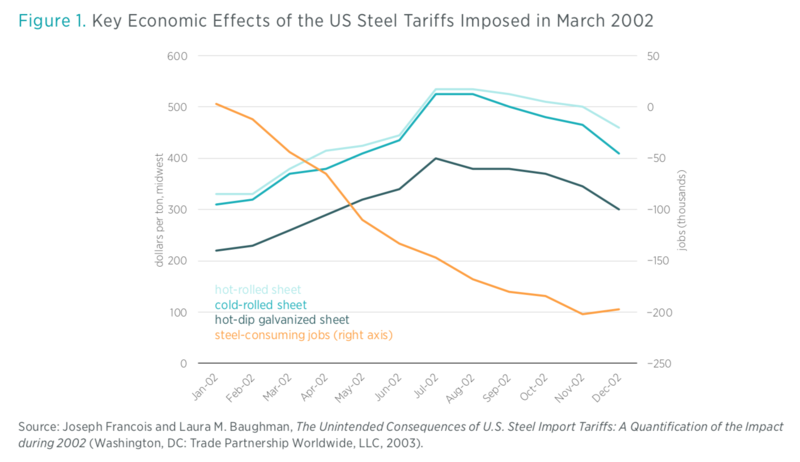 Steel tariffs were imposed in March 2002, steel prices rose, and jobs in downstream steel-consuming industries declined (figure 1). Steel prices eventually reverted down to more market-driven levels, while the employment levels in steel-consuming manufacturing did not come back. By December, 200,000 American manufacturing workers had lost their jobs because of higher steel prices; and yet only 187,500 Americans were working for US steel producers. In other words, the number of American manufacturing workers who lost their jobs in 2002 to higher steel prices is greater than the total number employed by the US steel industry itself. Most American manufacturing firms are small and medium-sized businesses with little or no influence over the prices at which they can sell their product. These American manufacturers, therefore, are limited in the extent to which they can pass on higher prices to their customers. To the extent that they cannot pass on higher prices to their customers, they absorb the higher costs internally through smaller payrolls, less investment, less profit, or other cutbacks. Import taxes and trade restrictions increase the costs of imports and domestic goods. When the imports are intermediate inputs, then the duties result in higher input prices for American manufacturers. Every single American manufacturer continually faces competition from other manufacturers both domestically and abroad. An import tax on intermediate inputs raises prices, and every single American manufacturer that uses that input is at a competitive disadvantage. As experience shows, a result of US trade remedies is that American manufacturers and consumers pay higher prices for both imported and domestically produced goods, while American workers in downstream industries are left with fewer employment opportunities in less competitive firms. Moreover, because firms have to pay more for inputs that complement workers, the productivity of American workers who keep their jobs falls over time, which (all else equal) results in slower growth in real wages. Similarly, in the recent safeguard tariff decision on imported solar cells and modules, the Commission was only allowed to consider the impact that foreign competition had on the domestic firms seeking protection. The Commission was not allowed by statue to consider the effects of the tariffs on downstream industries, workers, and consumers. Meanwhile, a downstream industry association noted that the 30 percent tariffs on imported solar cells and panels would increase the price of solar cells and panels, reduce demand thereof, and lead to a loss of 23,000 American jobs (mostly installation jobs). Bill Vietas, president of RBI Solar in Cincinnati, stated, “government tariffs will increase the cost of solar and depress demand, which will reduce the orders we’re getting and cost manufacturing workers their jobs.” Further, the higher prices were expected to result in the delay or cancelation of billions of dollars in solar investments. US trade remedy rules were crafted nearly 100 years ago when trade consisted mostly of agricultural and final goods. Today, trade as a share of the economy is double what it was 50 years ago, and US firms rely on the ability to do international business for both their domestic and export sales. For instance, 43 percent of total US imports are intermediate goods that US manufacturing firms use in domestic production. The foreign value-added content of US exports is 15 percent. This is not a good or bad thing (it is simply a matter of fact). That said, two of America’s most competitive sectors—advanced manufacturing and energy—are among the most reliant on imports. When the US government imposes taxes on imports that American manufacturers rely on for intermediate inputs, those government actions are making it more expensive for American manufacturers to stay competitive both here and abroad. Yet according to data by the Commission, over 75 percent of the current antidumping and countervailing duty orders in place are on intermediate inputs that those manufacturers need to stay competitive. Antidumping, countervailing duties, and safeguards are generally referred to as trade remedies, but they do not remedy anything—they do not stop foreign subsidies and they do not stop foreign competitors from selling at “less than fair value.” Furthermore, the disjointedness between the meaning of “less than fair value” in US trade remedy regulations and in US domestic antitrust and commerce laws signals a miscalculated economic policy approach (see box 1). The economic reality is that American firms need access to globally competitive prices for their inputs, and this means that updating US trade statutes is an economic imperative. Many reforms could be implemented to improve the current system. It is, however, often easier to start with one small change. In our view, that change would require the following (as described earlier): (1) The agency making the determination, namely, the Commission, identifies the downstream industries and users; (2) the Commission determines whether there is a reasonable indication that the downstream industries and users would be materially injured from a duty on the imported merchandise; and (3) the Commission weighs the effects of the duty on the petitioning firm against the effects of the duty on downstream industries and users. The change we propose is in line with what other governments have recently pursued, including Australia and the European Commission. In 2009, the Australia Productivity Commission issued a report on the country’s antidumping system. That report recommended reforms to the antidumping system to help ensure that “measures are not imposed if they are likely to be ineffectual or otherwise disproportionately or unreasonably costly for downstream entities.” In 2011, the Australian government announced that downstream industries would be provided support to actively participate in antidumping investigations. 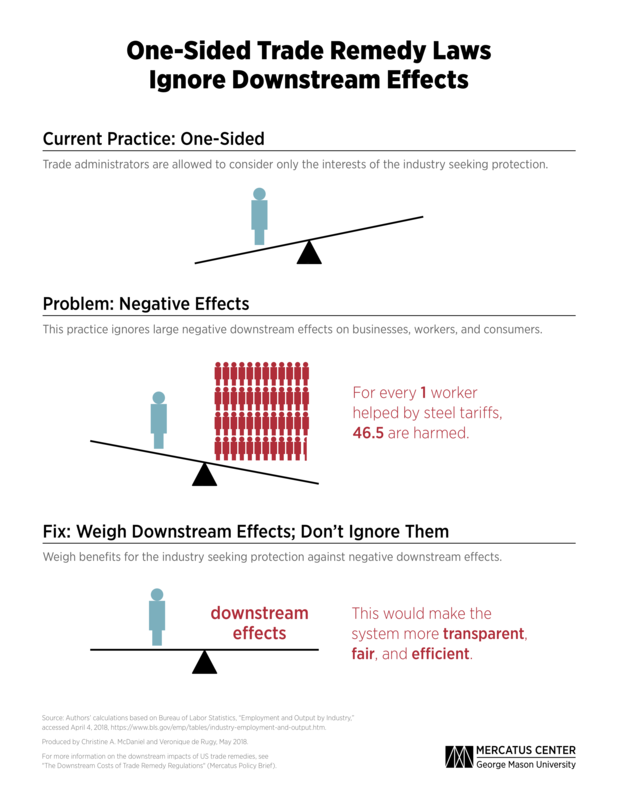 Because the US International Trade Commission is not allowed to consider the potential downstream effects of antidumping, countervailing duties, or safeguards when determining trade remedy regulations, laws intended to remedy unfair competition in one sector can end up causing disproportionately large costs to downstream sectors and users—and have a negative net effect on the national economy. The damaging effects of these policies have been concentrated largely in American manufacturing. Over half of the current 400-plus antidumping and countervailing duties are on iron and steel products that a wide swath of American manufacturers need access to in order to be competitive both at home and abroad.